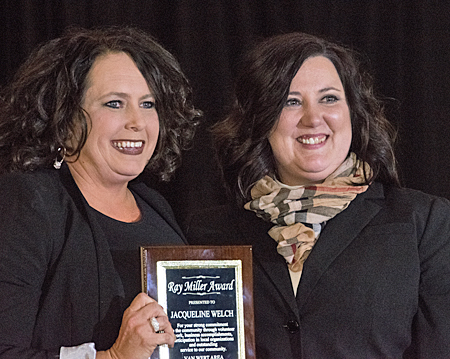 Van Wert Manor Administrator Jacque Welch was named the winner of the Ray Miller Award, while Van Wert Health earned the Crystal Image Award for its community activities and projects during the Van Wert Area Chamber of Commerce’s 97th Annual Dinner and Awards Ceremony. The event was held Wednesday evening at Wassenberg Art Center. Welch also was given a portion of the credit for Van Wert Manor’s assisted living facility earning a statewide No. 1 rating. Other nominees were Nancy Sink, the original CEO/CFO of Family Health Care of Northwest Ohio; and local businessman Mark White, whose nursing care, real estate, and development efforts have positively affected the community. 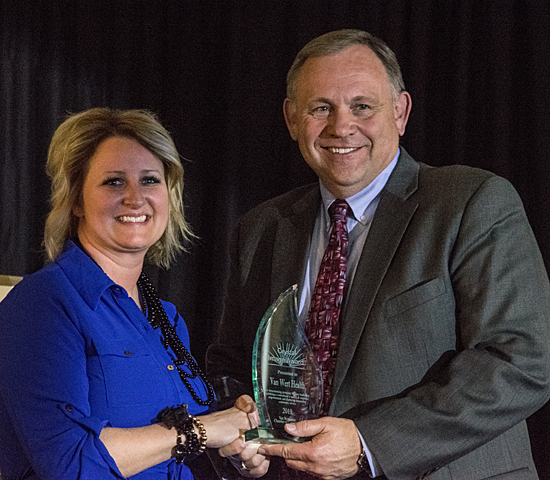 Welch’s Van Wert Manor was also a nominee for the Crystal Image Award won by Van Wert Health. Hospital President/CEO Jim Pope accepted the award on behalf of the hospital, which was honored for its long history of providing healthcare to the community, as well as its many projects over the decades. “The progression from an eighteen-unit building with one tiny operating room to the sleek and modern two-campus hospital we have today has been the collaborative work of countless visionary people,” said Chamber Board of Directors 2018 chairperson Leah Treece in presenting the award. Treece talked about the many projects the hospital has undertaken over the past 113 years, including the 2018 completion of the Van Wert North ambulatory clinic project, and the current $45-million surgical/inpatient facility project that will be completed in 2020. “Van Wert Health is even more than all I’ve mentioned so far,” Treece added. “Their mission of stewardship extends to partnerships with every conceivable health care initiative in the community, from health fairs at the elementary schools to participation in back-to-school events and connection with high school students considering health care careers through the CEO (Career Education Opportunities) program. “It is evident that Van Wert Health values the input of all stakeholders and believes in the importance of the community’s trust,” she noted. Pope said he feels the hospital is very much involved in raising the level of success in the community. Prior to the announcement of the major award winners, Chamber President/CEO Mark Verville gave opening remarks and introduced Chamber board members and special guests, which included State Representative Craig Riedel, local government officials, and a representative from Governor Mike DeWine’s office. He also credited his predecessor, Susan Munroe, and Office Manager Erika Wise for their contributions to making the Chamber what it is today. Treece distributed Golden Shovel Awards to entities with major improvements, additions, or construction projects, and Milestone Awards to companies with a variety of company anniversaries. Brewed Expressions, for its opening of a newly renovated location in downtown Van Wert. Braun Industries, for the expansion of its production capabilities by investing more than $675,000 in the plant in order to facilitate the addition of a new ambulance production line and the addition of 46 full-time employees. Van Wert Business Development Corporation and Robinson Investments, for their collaborative venture to build a 100,000-square-foot spec building on Grill Road. The building is now occupied and operational. Eastside Auto Repair, for its purchase of the former White’s Garage facility and renovation of the property into a late-model auto dealership and repair shop. Edward Jones/Eric Hurless, for completing a move to his current location at 1119 Westwood Drive. Law Office of Dawn Kennedy, for its purchase and renovation of an office at 110 N. Washington St.
Lincolnview Local Schools, for the construction of a $4.5-million community center project, a one-of-a-kind, state-of-the-art facility unique to northwest Ohio. Van Wert County Foundation, for its $1.8-million investment in constructing a new park on the site of the former Franklin Elementary School. Van Wert Federal Savings Bank, for completing a new building expansion project in 2018. The project added additional office space to the bank’s facility on South Shannon Street. Van Wert Health, for completion of its $12-million Van Wert Health North facility that provides a walk-in clinic, family medicine, physical medicine, laboratory services, and the region’s largest and newest open MRI. The YMCA of Van Wert County, for its work on Hickory Sticks Golf Club, which was gifted to the YMCA by its previous owners, with improvements made by YM staffers. Stephanie Dawn (10 years)/KAM Manufacturing (30 years). A panel discussion featuring Pope, Van Wert Area Economic Development Corporation Executive Director Stacy Adam, and Van Wert County Foundation Executive Secretary Seth Baker, while Tafi Stober, who will become the second executive director of the Niswonger Performing Arts Center of Northwest Ohio in May, facilitated the discussion. Premier sponsors for the event included Van Wert Health and Central Insurance Companies, while awards sponsors included Van Wert Manor, Vantage Career Center, Quick Lane Tire & Auto Center, StateWide Ford Lincoln, R&R Employment Inc., Chief Supermarkets, and Federal Mogul Corporation. The dinner was catered by Willow Bend Country Club.